Kheer is a South Asian rice pudding made by boiling rice, broken wheat, or vermicelli with milk and sugar; it is flavoured with cardamom, raisins, saffron, cashew nuts, pistachios or almonds. It is typically served during a meal or as a dessert. 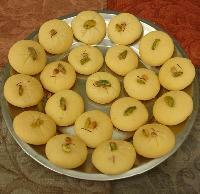 is a traditional dessert in northern Indian Cuisine, Pakistani Cuisine, Nepali cuisine and Bangladeshi cuisine. It is similar to a glazed doughnut in terms of ingredients, but differs in texture and taste. In South India, a similar pastry is known as Badushah. Laddu or Laddoo is a ball-shaped sweet popular in Indian Subcontinent as well as regions with immigrants from the Subcontinent such as Hijaz. 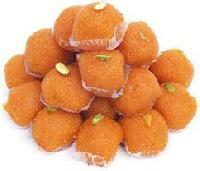 Laddu is made of flour and sugar with other ingredients that vary by recipe. It is often served at festive or religious occasions. Roti is generally an Indian bread, made from stoneground wholemeal flour, traditionally known as atta flour, that originated and is consumed in India, Pakistan, Nepal, Sri Lanka and Bangladesh. It is also consumed in parts of South Africa, the southern Caribbean, particularly in Trinidad and Tobago, Guyana, and Suriname, and Fiji. Its defining characteristic is that it is unleavened. 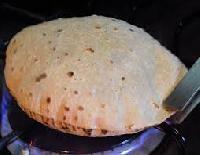 Indian naan bread, by contrast, is a yeast-leavened bread. A kulcha in Indian cuisine is a bread-like accompaniment, made of processed flour (Maida) leavened with yeast. It is a preparation made of black grams soaked (either lightly/overnight)in water and then sauted in mustard oil in a wok. All kinds of garam masala made as paste on a sil is used for flavouring and chana is also ground to form a paste used as thickener. This thickens the masala and makes gravy as per desire. After proper seasoning and bhunjana water is added to the mix for gravy as desired.Ghugni is an evening snack in Eastern India (Assam, Bengal, Bihar, Orissa). Black gram (Kala Chana) or dried yellow peas or dried white peas is cooked with gravy, in the traditional eastern Indian style. It is then served with kurmura (puffed rice), and at times with hot onion pakoda/bhajiya. beaten rice, served with a coat of creamy curd and sugar or jaggery. In winters, this is mildly baked and accompanied with a thick spicy preparation made of peas and onions. This is a traditional and authentic bharwa karela recipe from Uttar Pradesh.We follow this same recipe from generations in my community and my household. Addition of raw mangoes and fennel powder make it different and special .Try this you will surely love this. Aloo Paratha is an Indian recipe and one of the most popular breakfast dishes throughout western, central and northern regions of India. Aloo (potato) stuffed Parathas are basically unleavened dough stuffed with a spiced mixture of mashed potato, which is rolled out and cooked on a hot tawa with butter or ghee. Usually butter or chutney is served with Aloo Paratha and in rural parts of northern and western India, lassi is served along with it.